Looking for a great organic snack? Look no further! Nature's Path has Gingerbread Love Crunch Granola. Does that sound good to you? 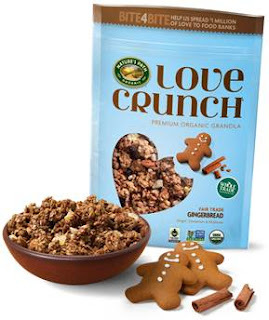 A festive new premium granola, Gingerbread Love Crunch is also a gift that gives back. As part of the company’s Bite4Bite initiative, Nature’s Path will donate the equivalent to every bag sold in cash and organic food to a food bank, promising to help brighten the holidays of those in need. Like all Nature’s Path products, Gingerbread Love Crunch is 100% USDA certified organic, which means it doesn’t contain artificial preservatives, additives, genetically modified organisms (GMOs) or synthetic pesticides. Additionally, Gingerbread Love Crunch is a Fair Trade Certified product, which directly helps improve the lives of farmers and their families in developing countries. Gingerbread is one of my favorite flavors! This would make a really nice snack for your children. Healthy too! Or maybe you could set some out for guests during your holiday festivities. Or just because you like the taste! Pick up a bag of Nature's Path Love Crunch Gingerbread Granola. My daughter said this would be great for breakfast with a glass of milk! One neighbor will receive a 8.5 oz. bag of Nature's Path Love Crunch Gingerbread Granola. Disclosure:I received no monetary compensation for this post. I did receive samples of Nature's Path Love Crunch Gingerbread Granola. All quotes in red are taken from the sponsor's website or email. All thoughts and opinions are mine. I'm a sucker for gingerbread! I also would love to try their Love Crunch Dark Chocolate & Red Berries. This looks so so so yummy! pumpkin pie would be a great flavor!